I took care of a trauma patient a few months ago who was in a motor vehicle crash on her prom night. Initial imaging showed some left sided rib fractures and a broken leg. She was admitted to the regular nursing floor for further observation. When I saw her in the morning (4 hours after arrival) I found that she had one of those classic "seat belt signs". She was also was quite tender on abdominal exam. Her labs revealed an elevated white blood cell count, in itself not necessarily a concerning thing as young trauma patients with broken limbs will often mount a reactive leukocytosis. But her abdominal exam bothered me. I reviewed the CT with the radiologist. She didn't see anything unusual. So I repeated the CT and the blood work 2 hours later. Her WBC count was now over 20. The CT scan, however, was again read as "normal". When I examined her, she had frank peritonitis. I took her to the OR and found she had perforated her proximal jejunum. Enteric contents were actively leaking into her peritoneal cavity. Everything else looked OK. We lopped out the damaged intestinal segment and put everything back together again. She did very well afterwards. Blunt injury to the intestinal tract is a terrifying diagnosis in the world of trauma surgery. The CT image you see above is from the young lady's 2nd scan. What you don't see is anything that would ordinarily mandate an operation. There is no free air. No ascites. No obvious evidence of bowel injury. You just have to be patient with these cases. Examine the patients frequently. Don't be comfortable with negative CT scans. It also helps to have a firm grasp on what is meant by the term "peritoneal signs". These are the cases where you simply have to know what the hell you are doing, individually. Collaborative care won't get you anywhere. You won't receive an award for just removing the patient's foley after 24 hours. Your Accountable Care Organization won't send you an Olive Garden gift certificate for limiting the total inpatient costs. It's all on you, buddy. Prom night 2012 is ten months away. Nice example of how repeat examination of a patient is helpful. Can't simply rely on technology. Great job, Buckeye! Wow Im moving to Cleveland.. Great save!! did you stick a scope in first? NO. Blunt trauma makes me nervous. I didn't just address the jejunal perf. I looked in the lesser sac, examined the duodenum, mobilized the right colon (because the cecum looked "odd", ended up just being reactive serositis.) I think you can't just assume there is one injury when youre dealing with blunt intestinal trauma. Old fashioned, maybe, but I just think it's the safest course of action. Not a time for laparoscopic heroics. Not to imply laparoscopic heroics was appropriate here. Sounds like she was committed to the full trauma lap anyways from what you describe from the clinical picture. Had a similar case last year - a guy rollerblading, hit one of those waist-high concrete posts - peritonitis -> trauma lap -> complete jejunal transection! Pretty classic case you describe. Serial exams always benefit trauma surgery patients. 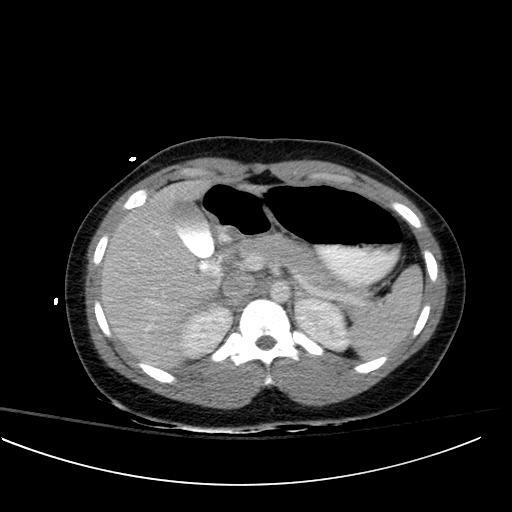 Usually you get lucky with cases like this and see a little free fluid on the scan. We over rely on technology. Probably because it is so much easier to look at the scan than reexamine the patient/admit/observe etc... I could fill this page with abdominal catastrophes w/ negative or nearly negative CT imaging but almost none without physical exam findings. Your case is an example of experience that makes good surgeons great surgeons. Great case. Yes, I agree completely. Sometimes a seemingly unimportant aspect become vital in treating an patient. Nice. I hope if I'm ever on the table, you're the guy standing over me. It's a good thing that you remind people to be patient when making assessments. It might take quite some time to diagnose a patient. Interesting case, thanks for sharing it. Hoping that you are just enjoying a breather, spending time with family, saving the odd life... and not giving up on your great blog! How about a review of Cheney's latest contribution to historical fiction? Nice account Buckeye. Thanks. It goes to show that gut feel and experience is as important as technology in very many situations. Lucky patient. Great story and serial exams.. Where are your new posts? Hope you can return to them. What passes for serial abdominal exams in many places would not have caught this until much later. Where are you? Just logged on to see what you had to say about the scotus decision yesterday. You're sorely missed in th blogosphere. You must have had a great feeling after that surgery. Great job! !